Cell theory is the idea that the cell is the fundamental structural and functional unit of all living organisms and that new cells are formed from other existing cells. This theory is one of the foundations of modern biology. First formulated in the early 1800s in landmark publications by Mathias Jacob Schleiden and Theodor Schwann, the foundations of this theory began in the mid-1600s through advances in microscopy. Today, it is held that all organisms are composed of one or more cells, all vital functions of an organism occur within cells, and cells contain the hereditary information necessary for regulating cell functions and for transmitting information to the next generation of cells. In a properly functioning multicellular organism, each cell typically has the capacity to provide a useful function for the organism. In turn, the organism provides the necessary nutrients, removal of waste products, and other actions necessary for the survival, growth, and maintenance of the cell during the lifetime of the cell. When cells fail to properly function, such as displaying uncontrolled growth as in cancer, the multicellular organism as a whole can suffer. The principle tenets of cell theory largely were formulated in two publications in the 1800s. In 1838, Matthias Jacob Schleiden, a botanist, published a monograph titled Beiträge zur Phytogenesis in which he proposed that all plant tissues are made from cells (Tavassoli 1980; Bunch and Hellemans 2004). The following year, in 1839, Theodor Schwann, in his publication Mikroskopische Untersuchungen über die Übereinstimmung in der Struktur und dem Wachsthum der Thiere und Pflaznze, generalized this to all living organisms, proposing that all animal tissues also are made from cells and that eggs are cells as well, with all life starting as a single egg (Tavassoli 1980; Bunch and Hellemans 2004). These landmark publications, after subsequent modifications, provided what would become known as the cell theory. According to this theory, the cell is the minimum quantity of life, capable of independent development, yet an integral part of multicellular organisms; "an individual in a society" (Tavassoli 1980). Prior to the development of this theory, people recognized tissues and organs, but considered them to be simple substances similar to nonliving materials, not recognizing the level of organization between simple substances and tissues (Bunch and Hellemans 2004). The foundation for the cell theory began two centuries earlier, in the 1600s. In 1665, Robert Hooke published his work Micrographia, which contained a number of microscopic observations, and in which he coined the term cell, so called because his observations of plant cells reminded him of the small rooms that monks inhabited, which were called "cellula." Hooke is often credited with the discovery of the cell. 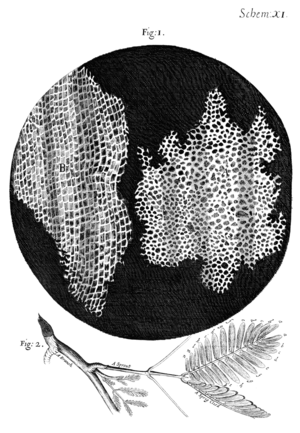 However what Hooke actually saw was the non-living cell walls from cork. The cell walls observed by Hooke gave no indication of the nucleus and other organelles found in most living cells. In his observations, Hook did not indicate that he was making a fundamental discovery about life (Bunch and Hellemans 2004). The first man to witness a live cell under a microscope was Antonie van Leeuwenhoek, who in 1674 described the algae Spirogyra and named the moving organisms animalcules, meaning "little animals." Leeuwenhoek probably also saw bacteria (Porter 1976). The idea that cells were separable into individual units was proposed by Ludolph Christian Treviranus (1811) and Johann Jacob Paul Moldenhawer (1812). All of this finally led to Henri Dutrochet (1776-1847) formulating one of the fundamental tenets of modern cell theory by declaring that "the cell is the fundamental element of organization" (Dutrochet 1824). In 1831, Robert Brown first noticed that plant cells all contain a nucleus, and in 1835 Johannes Purkinje noted that animal tissues also are made of cells, although these observations did not attract attention to the importance of cells (Bunch and Hellemans 2004). Recognition of the importance of cells changed quickly in 1835 with Schleiden's proposal that all plant tissues are made of cells and Schwann recognized that all animals tissues are made from cells and suggested all life starts as a single cell. Schleiden and Schwann generally are credited with the cell theory because both contributed vital parts of the theory (Bunch and Hellemans 2004). Their theory accepted the first two tenets of classical cell theory, that living things are composed of cells and that cells are the basic unit of structure and function in living things. However, the cell theory of Schleiden differed from modern cell theory in that it proposed a method of spontaneous crystallization that he called "free cell formation," rather than the view that all cells are produced from other cells. Subsequent discoveries extended the cell theory. Karl Wilhelm von Nägeli showed that cells form by division of one cell into two, and in 1845 Karl Theodor Ernst von Siebold extended the cell theory to protists (Bunch and Hellemans 2004). In the 1840s, Rudolf Albert von Köllikeer reported that sperm are cells and that nerve fibers are part of cells. In the 1850s, Rudolph Carl Virchow promoted the cell theory and had the credo "all cells arise from cells" (Bunch and Hellemans 2004). Virchow's contribution in 1858 that all cells come from pre-existing cells completed the third component of classical cell theory. Thus, Virchow often is credited with cell theory along with Schleiden and Schwann. Cell theory is a widely accepted explanation of the relationship between cells and living things. Cell theory holds true for all living things, no matter how big or small, or how simple or complex. Since according to research, cells are common to all living things, they can provide information about all life. And because all cells come from other cells, scientists can study cells to learn about growth, reproduction, and all other functions that living things perform. By learning about cells and how they function, you can learn about all types of living things. Cells are the fundamental functional and structural unit of life. The cell is the fundamental unit of structure and function in living things. All cells come from pre-existing cells by division. All known living things are made up of cells. Some organisms are unicellular, made up of only one cell. Other organisms are multicellular, composed of countless number of cells. Viruses are considered by some to be alive, yet they are not made up of cells. The first cell did not originate from a pre-existing cell. See Origin of life. Cells can be subdivided into two basic categories: prokaryotes and eukaryotes. 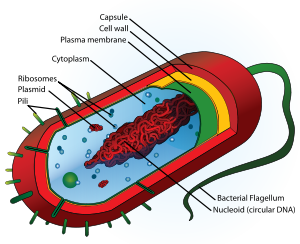 Prokaryotes lack a nucleus (though they do have circular DNA) and most other membrane-bound organelles (though they do contain ribosomes). Bacteria and Archaea are two divisions of prokaryotes. Eukaryotes, on the other hand, have distinct nuclei and membrane-bound organelles (mitochondria, chloroplasts, lysosomes, rough and smooth endoplasmic reticulum, vacuoles). In addition, they possess organized chromosomes that store genetic material. Bunch, B. H., and A. Hellemans. 2004. The History of Science and Technology: A Browser's Guide to the Great Discoveries, Inventions, and the People Who Made Them, From the Dawn of Time to Today. Boston: Houghton Mifflin. ISBN 0618221239. Dutrochet, M. H. 1824. Recherches Anatomiques et Physiologiques sur la Structure Intime des Animaux et des Vegetaux, et sur Leur Motilite Paris: Chez J. B. Bailliere. Retrieved September 20, 2008. Moldenhawer, J. J. P. 1812. Beyträge zur Anatomie der Pflanzen. Kiel: Gedruckt in de Königlichen schulbuchdruckerey durch C.L. Wäser. Porter, J. R. 1976. Anton van Leeuwenhoek: Tercentenary of his discovery of bacteria Bacteriol. Rev. 40: 260–269. Retrieved September 20, 2008. Tavassoli, M. 1980. The cell theory: A foundation to the edifice of biology Am J Pathol. 98(1): 44. Retrieved September 20, 2008. Treviranus, L. C. 1811. Beyträge zur Pflanzenphysiologie. Göttingen, H. Dieterich. Turner, W. 1890. The cell theory, past and present J Anat Physiol. 24(Pt 2): 253–287. Retrieved September 20, 2008. This page was last modified on 21 September 2008, at 17:30.